Use the ColorAnt Preferences to define the general behavior of the application. Maximum (based on absorption maximum). 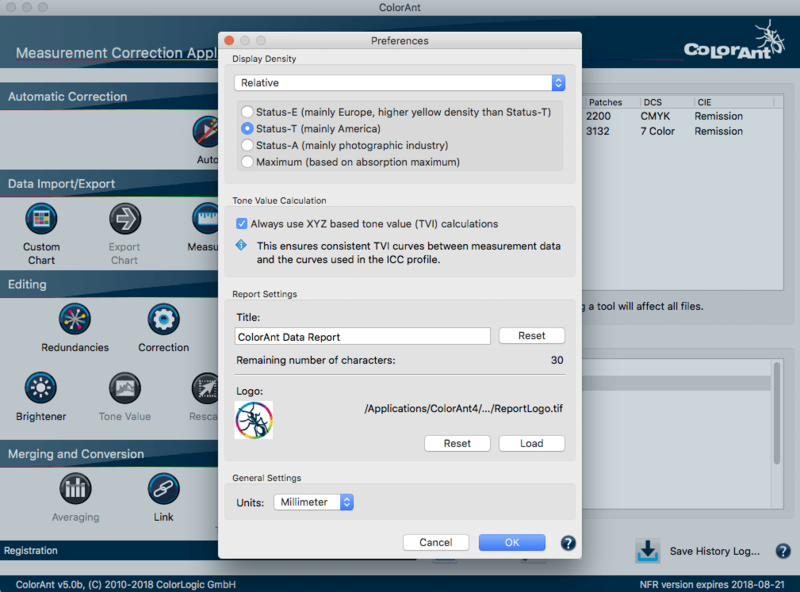 Tone Value Calculation: Changes the calculation and display of the TVI curves in the View dialog. The default setting in ColorAnt will calculate the TVI curves based on XYZ values. This mode ensures consistent views of TVI curves between measurement data and the same curves derived from ICC profiles. ICC profiles use colorimetric data. When spectral measurement data is present and the checkbox is disabled in Preferences, the TVI curves are based on density and the selected density mode is used for the calculation of the curves. This method is more consistent to the one used in print process control. Keep in mind that both the XYZ and the density method are not good indications for how TVI curves of spot colors actually look as these methods do not work well for non CMYK colors. Refer to the Curves View dialog instead to see curves according to colorimetric linearity or ISO 20654 (also known as SCTV). Report Settings: Defines the Title and Logo for the generated reports. Supported image formats are TIFF, JPEG or GIF in RGB color space. General Settings: Defines the measurement units used (mm or inches) in the Export Chart dialog.